The graph above shows 2010-11’s funding arrangements for Free Schools/Academies & Children/Families in comparison with the previous year (2009-10). 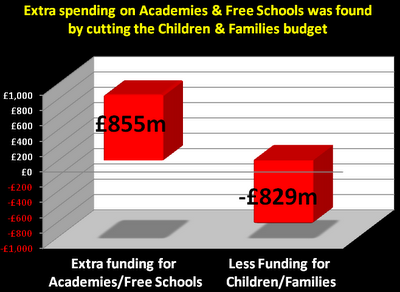 What is clear is this, academies/free schools received an additional £855,000,000 funding in 2010-11. But at the same time, Children & Families received £829,000,000 less. It leaves the government in the curiously deceitful position of claiming that overall net expenditure on these items increased. But this hides the truth that plenty of real cuts take place in education but that extra monies are needed for the Tories projects that conspire in the social engineering of our children. This entry was posted in News, Top story and tagged Free Schools, Funding, Statistics. Bookmark the permalink. It is interesting that the comment on the Department for Education website, warning that the financing of the academy programme was unsustainable, has now been removed. 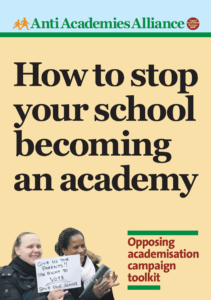 My concern is that much of the funding of the academies (including “free” schools) programme is going into private companies, through consultancy fees, higher insurance costs, higher licence fees, etc. 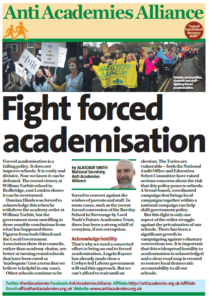 Although many will be linked with the academy chains, in the future all academies will be very vulnerable to education cuts because they will not have the gap filling backup of the local authority. The so-called ‘free-school’ movement is the trojan horse that the UK government is using to end the legal right to educate at home. 1) in two phases, school attendance of the two sixth form years is about to become compulsory. 2) because the government removed the right of under-18s to receive benefit, the benefit system cannot be used as a stick to force young people to attend the sixth form. 3) the age of sixth-formers, and the widespread availability of the internet, means that currently, any 16-18 year old could legally claim to be educating themselves at home. 4) the UK goverment is NOT changing the law, only to see thousands of young people ignore it. The very point of the law change is to create massive conflict with young men and women, allowing them to be demonised, and then subject to draconian new legal penalties, in readiness for the introduction of national-service. 6) thus the ‘free school’ movement is created. At first, the government gives massive financial incentives to the most powerful voices in the home education movement. 7) in return for the unprecedented funding, these figures are told to back changes in the law that require much more rigorous control of the circumstances of home education. 8) these changes, like those that altered the face of child care in the UK (and made it the most expensive in the world) favour large, well organised groups, that operate like a company, and disadvantage individual parents, or small groups of parents. 9) the new rules, sold on the back of propaganda that talks about ‘child safety’ rapidly move to requiring formal certificates, and training/facilities that ordinary parents cannot provide in their home-schooling. 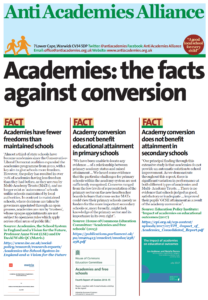 10) in other words, ‘free schools’ are converted, effectively, into ordinary schools, with similar restrictions, and anyone operating outside of this becomes illegal. 11) 16-18 year-olds wishing to educate themselves at home, lose the legal ability to pass the regulations that define legal ‘free school’ home-schooling. 13) the government declares that the public has spoken, and national service is required, so that young people see they have no choice but to conform. This project, a massive example of social engineering within the UK, was created as a central plank of the Blair government agenda, and has continued unchanged, regardless of who you are told runs things now. David Blunkett was Blair’s man overseeing the earlier stages of the plan described above. He did this when most of you thought that Blunkett had long been thrown into the wilderness through the various disgusting scandals Blunkett was central too. Some of your own children may have attended the embryo national service schemes increasing numbers of 16+ kids are visiting after the Summer school term. Blunkett’s own papers (written for a pseudo-NGO) describe the time frame between the embryo scheme, and the introduction of full blown, compulsory national service. It corresponds, of course, to the time frame in which the two years of sixth form education become compulsory.